THE ARMY BOMB squad was called in today, after a member of the public conducting renovations found a hand grenade. The gardaí put in a request for the Defence Forces to send in their bomb disposal team, who arrived on site at 3pm today. They carried out an assessment on the Mills 36 hand grenade, before making it safe and removing it to a safe location to be disposed of. 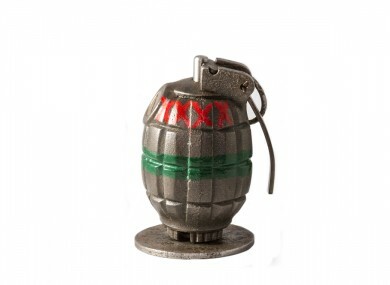 This kind of grenade was patented and developed by the British Army in 1915, and was manufactured up until the 1980s. According to a statement from the Defence Forces, the Mills 36 was “regularly used throughout the War of Independence and World War Two”. The scene was declared safe today, at 3.20pm. The army has said that “historic munitions” from conflicts in the early 20th century can be encountered from time to time. They advise the public that, if they should encounter such munitions, they should keep their distance and ring the gardaí. Email “Hand grenade 'used during War of Independence' found during renovations”. Feedback on “Hand grenade 'used during War of Independence' found during renovations”.